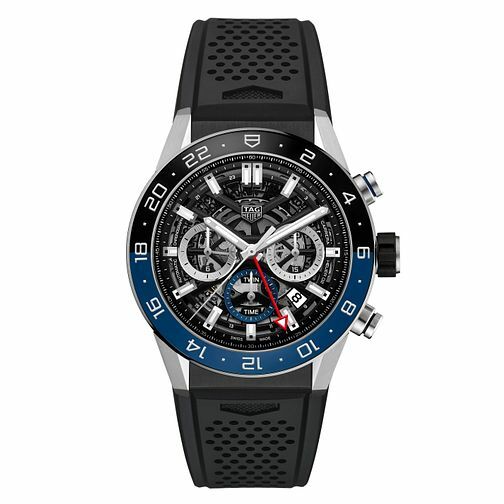 Inspired by motor racing, the Carrera boasts a fine-brushed stainless steel 45mm case, presenting a black skeleton dial with rhodium-plated luminescent hour indexes and hands. Chronograph counters and a permanent second counter feature, with blue accents for a pop of colour and to co-ordinate with the bezel. A handy date display also sits towards the 4-o-clock position. A black rubber strap finishes this sleek timepiece, with water resistancy of upto 100 metres.